I saw this scarf last year but wasn't quick enough to snag it before it sold out, so it was first on my list when I was looking for ones to buy this year. While I went through a huge blanket scarf phase and love them in theory, they always feel suffocating to me. So I thought this fell right in the middle - it's thin enough not to make me feel strangled, but still thick and cozy enough to keep me warm. It is a tad long on my 5'4" frame, but I still like the look and love wearing it. I shot this outfit a week before my due date, and actually wore some form of this look so many times during my last few weeks of pregnancy. 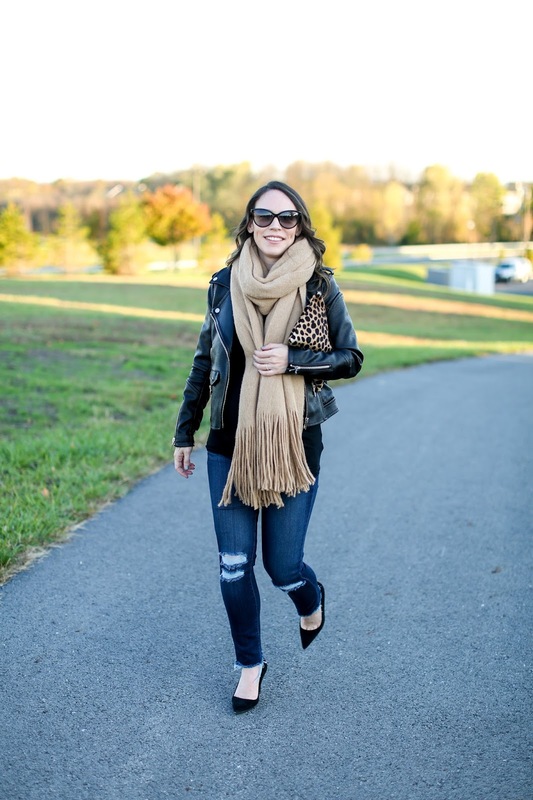 It's an outfit I wear a ton normally, but especially when I was running out of ideas (and options) of what to wear in my 9th month I found myself loving the comfort and ease of jeans, a comfortable tee, a great leather jacket and pumps. When all else fails, go back to the basics.